Here you can find reviews , articles and clippings from the press and the internet on Tonia’s work. Tonia Mishiali talks about PAUSE on the live show GENEKEA EPOTHESI (ΓΥΝΑΙΚΕΙΑ ΥΠΟΘΕΣΗ) on CYBC (National Broadcaster). World premiere at Karlovy Vary for the film PAUSE by Tonia Mishiali. Premiere at Karlovy Vary for Tonia Mishiali’s PAUSE. Tonia Mishiali’s PAUSE at the East of the West of Karlovy Vary. Teaser for Tonia Mishiali’s PAUSE, Film Republic launches sales in Berlin (Exclusive on Cineuropa). Film Republic to launch Tonia Mishiali’s PAUSE at Berlin Market (Exclusive on Variety). Tonia Mishiali in post-production with PAUSE. PAUSE selected for Karlovy Vary Works in Progress. Karlovy Vary introduces promising projects in progress from Central and Eastern Europe. 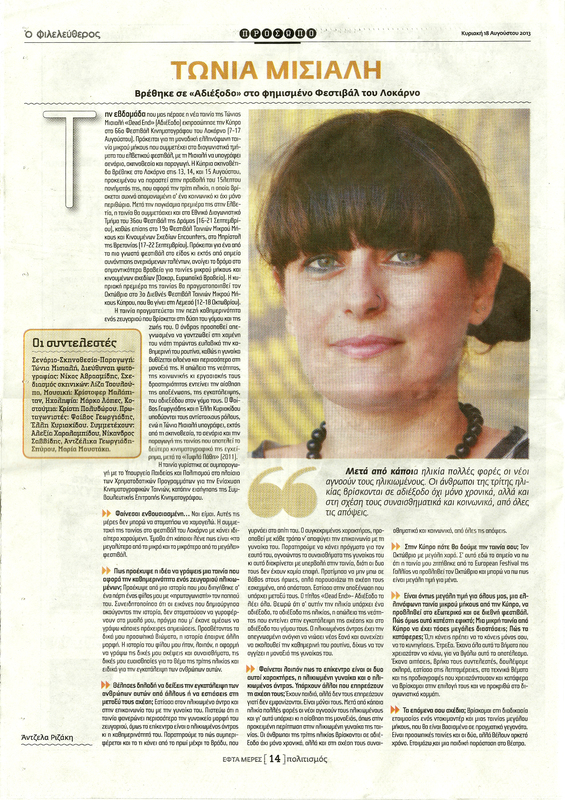 Interview of Tonia Mishiali, Artistic Director of Cyprus Film Days IFF on Cineuropa. Winners of Cyprus Film Days IFF. Tonia wraps the shoot for PAUSE. Article on Cineuropa. Cyprus announces grants for script development. Hambis and the goblins by Tonia Mishiali is selected. The cinema advisory committee of Cyprus supports 23 projects. Hambis and the goblins supported for script development. Mentioned in the news of Connecting Cottbus, as Berlinale Talents alumna. Cyprus report on FNE, Menopause in production. Cyprus Cinema in Cannes – Lullaby of the butterfly by Tonia Mishiali in the short film corner. The Courts des Iles International short film festival officially selected DEAD END for its 2015 edition and HERE you can view the promo video of the film with Director Tonia Mishiali. The new Artistic Committee of Cyprus Film Days International Film Festival as announced officially on the Ministry of Education & Culture of Cyprus Website. Tonia Mishiali is one of the Committee members appointed by the Ministry of Education & Culture and Rialto Theatre. The new Artistic Committee of Cyprus Film Days International Film Festival is announced on parathyro.com. Tonia Mishiali is one of the Committee members appointed by the Ministry of Education & Culture and Rialto Theatre in Cyprus. The new Artistic Committee of Cyprus Film Days International Film Festival is announced. Tonia Mishiali is one of the Committee members appointed by the Ministry of Education & Culture and Rialto Theatre in Cyprus. Tonia Mishiali is one of the winners of the ISFFC (The International short film festival of Cyprus) as announced on the official site of the Festival. Phileleftheros newspaper announces the winners of the ISFFC (The International Short Film Festival of Cyprus). Tonia Mishiali’s “Lullaby of the butterfly” wins BEST NATIONAL FILM and BEST CINEMATOGRAPHY awards. Politis Newspaper and parathyroid.com have dedicated an article on Tonia Mishiali’s new short film “Lullaby of the butterfly”‘s World Premiere in Sarajevo Film Festival. Click HERE to view the article online. 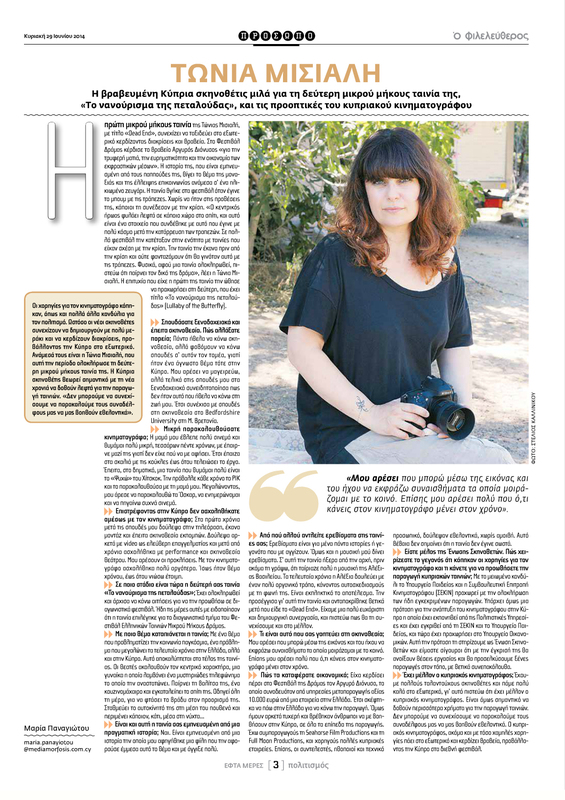 Meropi Moyseos has written a beautiful article in POLITIS Newspaper about Tonia Mishiali’s new film LULLABY OF THE BUTTERFLY. Click HERE to view the article on WORLD THEATRE DAY and the staged reading Tonia directed in philenews.com. Click HERE to view the article on WORLD THEATRE DAY and the staged reading Tonia directed in CITY FREE PRESS. World Theatre day and Tonia Mishiali directed a staged reading at ETHAL in Limassol. Click HERE to view the article on foni-lemesos.com. 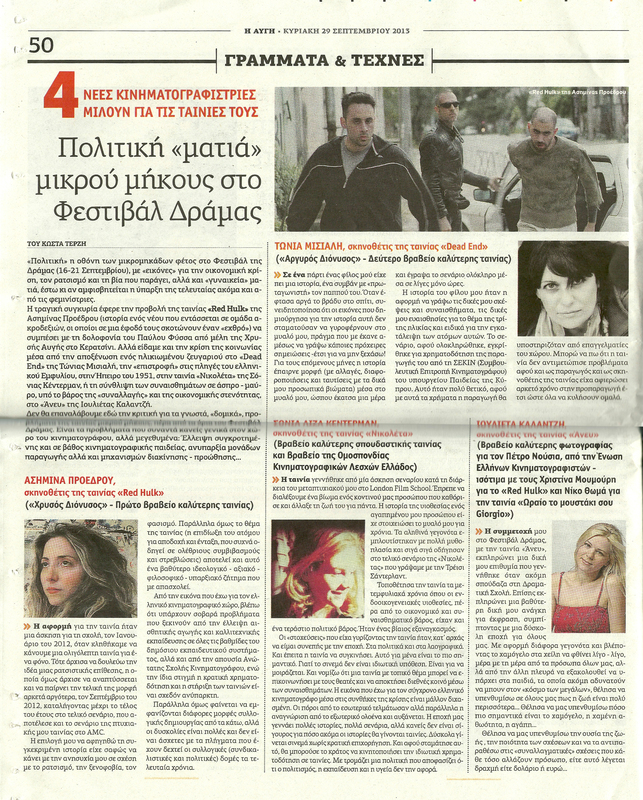 Parathyro.com and Politis newspaper wrote an article with wishes for 2014 from artists. Tonia Mishiali was one of them. parathyro.com has written an article on the winners of the International Short Film Festival of Cyprus. DEAD END has won two awards: Tonia Mishiali has won the “Michael Cacoyiannis Directing Award” and Marco Lopez has got the Special Mention for “Best Sound Design”. Lifo.gr has written an article on the winners of the International Short Film Festival of Cyprus. DEAD END has won two awards: Tonia Mishiali has won the “Michael Cacoyiannis Directing Award” and Marco Lopez has got the Special Mention for “Best Sound Design”. The winners of the International Short Film Festival of Cyprus have been announced on the Festival’s official site. Two awards for the film DEAD END: Tonia Mishiali has won the “Michael Cacoyiannis Directing Award” and Marco Lopez has got the Special Mention for “Best Sound Design”. Tonia Mishiali has been awarded the “Directing Award” for the “pseudo-realistic depiction of selfishness and loneliness”. You can read the official article online HERE. The Greek online movie magazine flix.gr has published an article about the International Short Film Festival of Cyprus and the Cypriot films that compete. DEAD END is one of them. 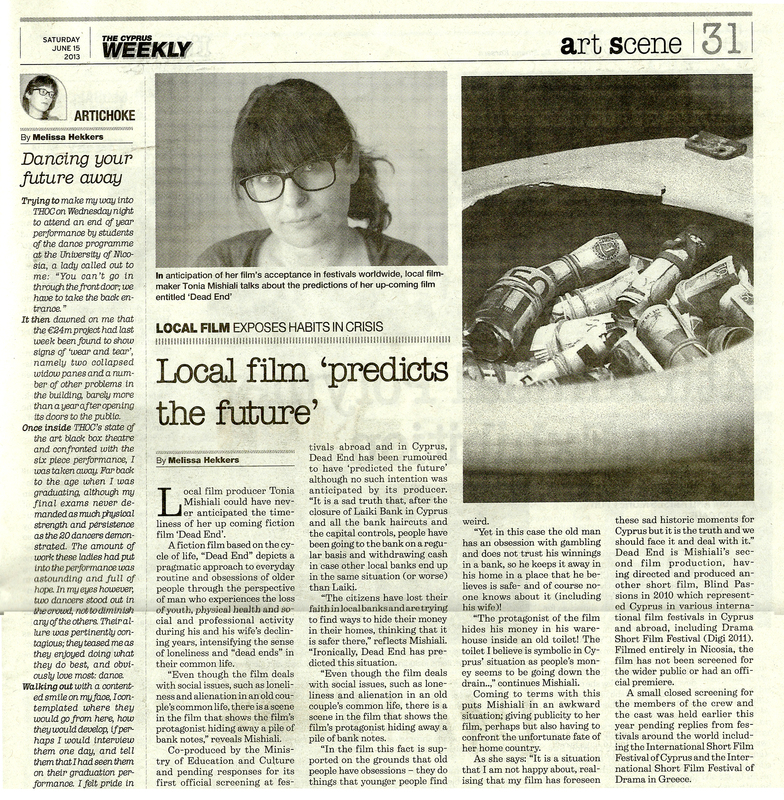 Politis newspaper in Cyprus has published an article about the International Short Film Festival of Cyprus. There is a special mention about DEAD END and its Festival journey and awards. Fileleftheros newspaper in Cyprus has published a small article in its “Agenda” section about the International Short Film Festival of Cyprus. There is a special mention about DEAD END. Go2.com.cy writes about the films competing in the International Short Film Festival of Cyprus and the Festival itself. Lemesos.blog writes about the films competing in the International Short Film Festival of Cyprus and the Festival itself. Cyprusnews.eu writes about the films competing in the International Short Film Festival of Cyprus and the Festival itself. O ΦΙΛΕΛΕΥΘΕΡΟΣ (a Cypriot newspaper) has published an article with title “Another Award for Tonia Mishiali” about Tonia Mishiali winning another prize for her film DEAD END, this time a “Best Director” prize at The Athens International Film Festival “Opening Nights” in Athens Greece. 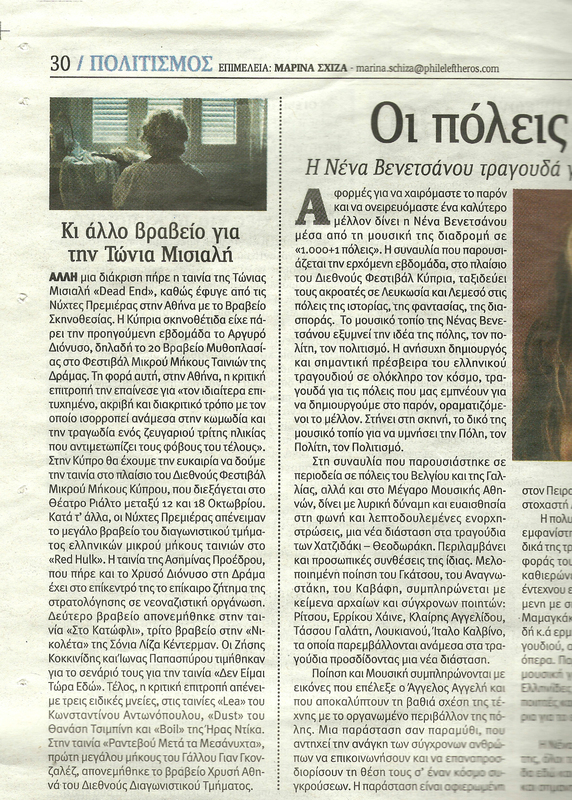 Η ΕΦΗΜΕΡΙΔΑ ΤΩΝ ΣΥΝΤΑΧΤΩΝ (The editor’s newspaper) has published an article about the films that have been awarded at The Athens International Film Festival “Opening Nights” in Athens Greece. YOU CAN VIEW THE ANNOUNCEMENT ONLINE HERE. Parathyro.com has written an extensive article based on an interview with the Minister of Education & Culture in Cyprus talking about the Cypriot films’s success at Festivals abroad. The Greek newspaper Η ΑΥΓΗ has written an article on its online version about the awards given by the The Athens International Film Festival “Opening Nights” in Athens Greece. It is mentioned that on the printed version there is a special mention on DEAD END and its director Tonia Mishiali. 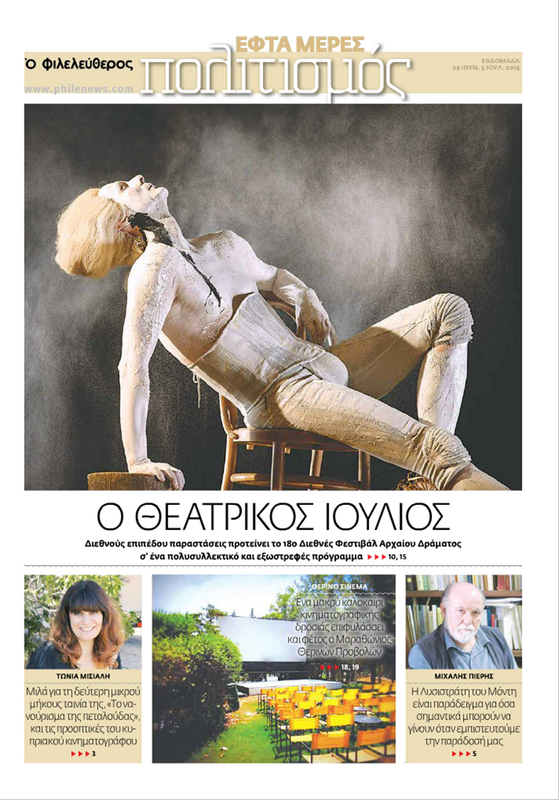 The Greek newspaper ΤΟ ΕΘΝΟΣ (ethnos.gr) has published an article about the awards given by the The Athens International Film Festival “Opening Nights” in Athens Greece. The Greek newspaper ΕΛΕΥΘΕΡΟΤΥΠΙΑ (Enet.gr) has published the awards given by the The Athens International Film Festival “Opening Nights” in Athens Greece. 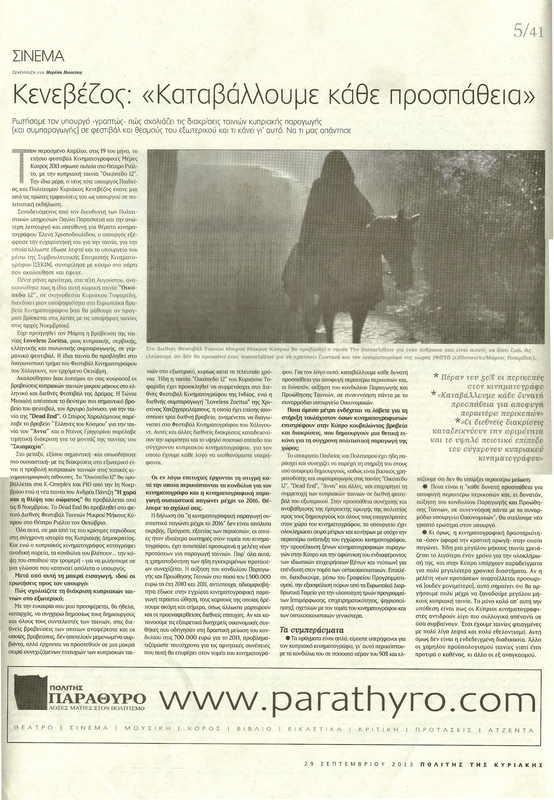 TO ΒΗΜΑ (TO VIMA) -an online Greek newspaper writes an article about the films that were awarded in the Athens International Film Festival. The Cypriot newspaper POLITIS has written an extensive article based on an interview with the Minister of Education & Culture in Cyprus talking about the Cypriot films’s success at Festivals abroad. 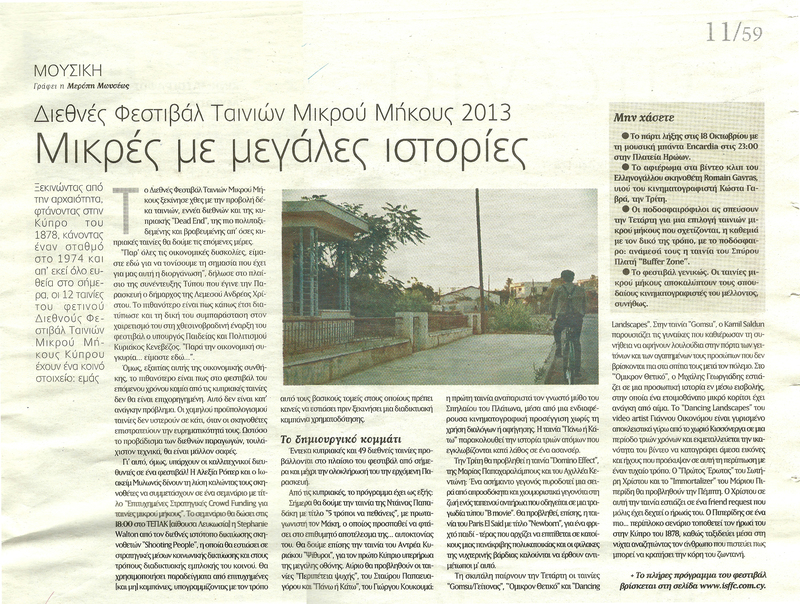 The Greek newspaper Η ΑΥΓΗ has written an article with title “POLITICAL VIEWS OF SHORT FILMS AT THE FESTIVAL OF DRAMA” . Tonia Mishiali and 3 other filmmakers talk about their films. The Athens International Film Festival “Opening Nights” in Athens Greece announces its winners on its official site. DEAD END’s director Tonia MIshiali has won the “Directing prize”. The jury praised the Director for “the highly successful, accurate and discrete way that balances between the comedy and tragedy of an elderly couple facing the fear of the end”. Flix.gr (a Greek site which specialises in cinema) has written an article on the winners of the Athens International Film Festival “Opening Nights”. DEAD END’s director Tonia MIshiali has won the “Directing prize”. The jury praised the Director for “the highly successful, accurate and discrete way that balances between the comedy and tragedy of an elderly couple facing the fear of the end”. Nooz.gr (a Greek news site ) has written an article on the winners of the Athens International Film Festival “Opening Nights”. DEAD END’s director Tonia MIshiali has won the “Directing prize”. The jury praised the Director for “the highly successful, accurate and discrete way that balances between the comedy and tragedy of an elderly couple facing the fear of the end”. Cypriot newspaper POLITIS has dedicated a whole page on Tonia Mishiali and her film DEAD END after she has won the “Silver Dionysos” at the Short Film Festival in Drama. Title: “Award winning Director Tonia Mishiali talks to POLITIS. DEAD END with a “way out”. After her important prize at the Film Festival in Drama, the film DEAD END continues its journey to more International Festivals”. Athinorama (a Greek magazine about entertainment) writes an article about the winners at the Short Film Festival in Drama with title “From the Short Film Festival in Drama: Bold Female directors”. On the same day the same article is published on its online version. Parathyro.com announces the Cypriot films selected to compete in the International Short Film Festival of Cyprus. DEAD END is one of them. The site SIGMALIVE has written an article on the Cypriot films that won awards in the Short Film Festival in Drama. The article praises Cyprus filmmaking and talks about the positive comments and reviews that all Cypriot films have got from foreign Film gurus. Η ΚΑΘΗΜΕΡΙΝΗ (www.kathimerini.com.cy/mobile) the Cypriot online version of the Greek newspaper writes an article online about the films that were awarded in the 36th Short Film Festival in Drama. A press release is posted by the Ministry of Education & Culture of Cyprus on its official site, announcing the success of 3 Cypriot Films in the Short Film Festival in Drama. DEAD END has received the “Silver Dionysos” (2nd prize for narrative film). The Jury has awarded DEAD END “for the tender approach, resourcefulness and the economy in expressive means, the award is accompanied by €10.000 worth of post production facilities and a complete set of digital camera, courtesy of Authorwave for the director’s next film”. 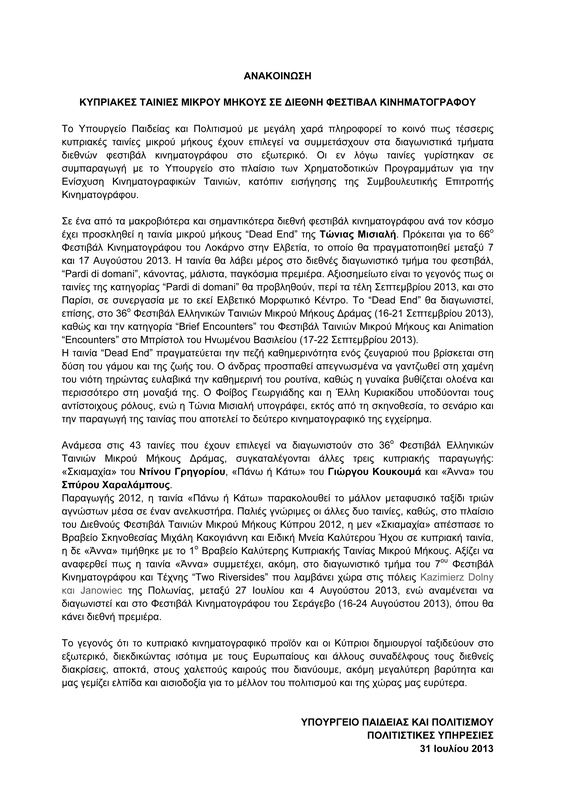 Η ΚΑΘΗΜΕΡΙΝΗ (kathimerini)a Greek newspaper writes an article online about the films that were awarded in the 36th Short Film Festival in Drama. The Russian newspaper Kp.ru has written an article on Director Tonia Mishiali after she has received the SILVER DIONYSOS AWARD in the 36th Short Film Festival in Drama. The article was the HEADLINE NEWS on the day. real.gr (an online Greek newspaper)writes an article about the films that were awarded in the 36th Short Film Festival in Drama. in.gr (an online Greek newspaper)writes an article about the films that were awarded in the 36th Short Film Festival in Drama. Cypriot newspaper POLITIS has written an article on the winners of the Short Film Festival in Drama with title “Winning Cypriot films at the Festival in Drama. Dramatically real. “Silver Dionysos” awarded to the Cypriot Tonia Mishiali. “Gold Dionysos” to a film that reminds the murder of Fessas”. TO ΒΗΜΑ (TO VIMA) -an online Greek newspaper writes an article about the films that were awarded in the 36th Short Film Festival in Drama. Cinemag (an online cinema Greek magazine) presents all the Directors whose films compete in the Athens International Film Festival “Opening Nights”. Tonia Mishiali answers some questions. The site bambuser.com has published the video of the Award Ceremony of the International Short Film Festival in Drama where the “Silver Dionysos” Award for DEAD END has been announced. You can view the award ceremony HERE. 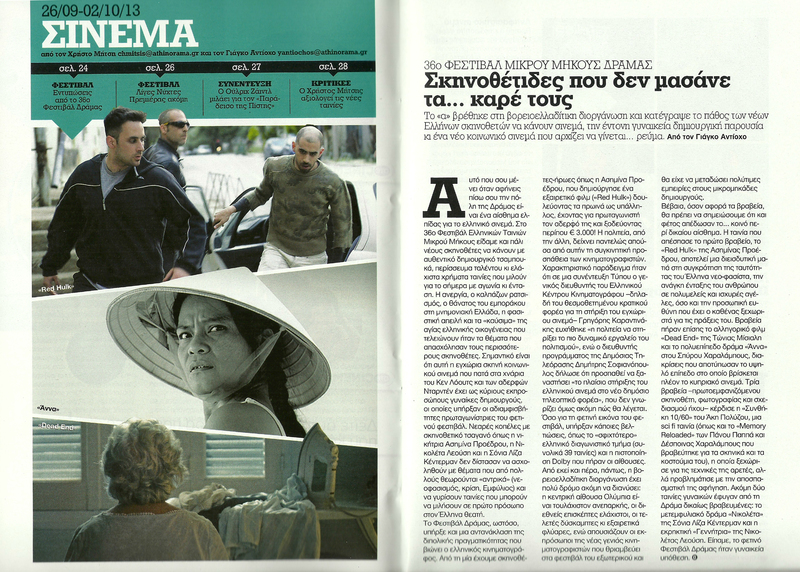 An article on Greek “Cinema” magazine site. The 36th Short Film Festival in Drama Greece announces the winners. DEAD END has won the “Silver Dionysos” (2nd prize for narrative film). The Jury has awarded DEAD END “for the tender approach, resourcefulness and the economy in expressive means, the award is accompanied by €10.000 worth of post production facilities and a complete set of digital camera, courtesy of Authorwave for the director’s next film”. The Greek news site tospirto.net has written an article about the the winners of the 36th Short Film Festival in Drama. LIFO.gr -an online Greek newspaper writes an article about the films that were awarded in the 36th Short Film Festival in Drama with Headline “The awards in Drama”. The blog “camerastyloonline” by Greek film critic Venia Vergou has announced the winners of the Short Film Festival in Drama. You can view the post online HERE. On the same day, Ms Vergou wrote a very good review on the films that she specifically liked at the Short film festival in Drama. DEAD END has been criticised as “the best film I have seen so far for the elderly, presented with respect and an effort to try and understand the distance that grows between two partners within the years. Sound design, use of music, performances, composition and mise-en-scene, all crafted with professionalism and sensitivity”. The Greek site flix.gr which specialises on films writes an article about the winners of the Short Film Festival in Drama. The Greek site flix.gr which specialises on films writes an article about the films screened at the 36th Short Film Festival in Drama on September 20th. The review about “DEAD END” is very good! 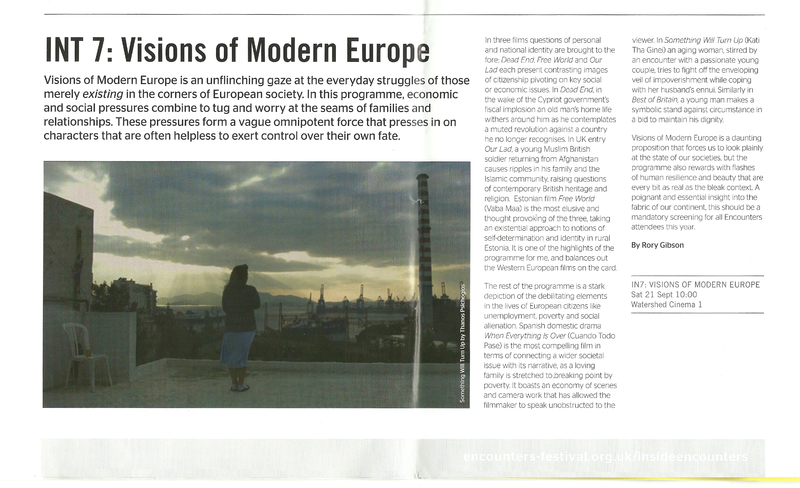 The Official magazine “Inside Encounters” of the Encounters Short Film & Animation Festival in Bristol UK on its 3rd Issue, writes an article on the section “Visions of Europe” which consists of five films screened at the Festival. DEAD END is one of them. The Official Greek magazine of the Short Film Festival in Drama presents on September 19th all the Directors whose films get screened on the same day with title “DIRECTORS’ CORNER”. DEAD END and Director Tonia Mishiali is included. The Greek movie site flix.gr has written an article about DEAD END regarding its participation in the International Short Film Festival in Drama. You can read the article on the site HERE. On the same day there was a link on twitter to the same article. //platform.twitter.com/widgets.js“>You can view it HERE. 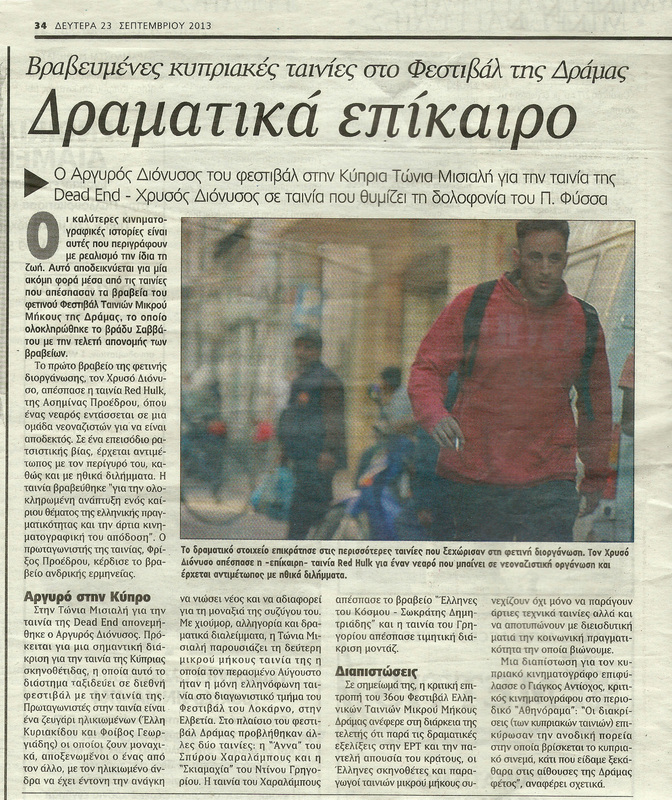 The Cypriot newspaper Fileleftheros dedicated Sunday’s article to Tonia Mishiali and her film “DEAD END”‘s World Premiere and Official Selection in Locarno Film Festival where she will be present. 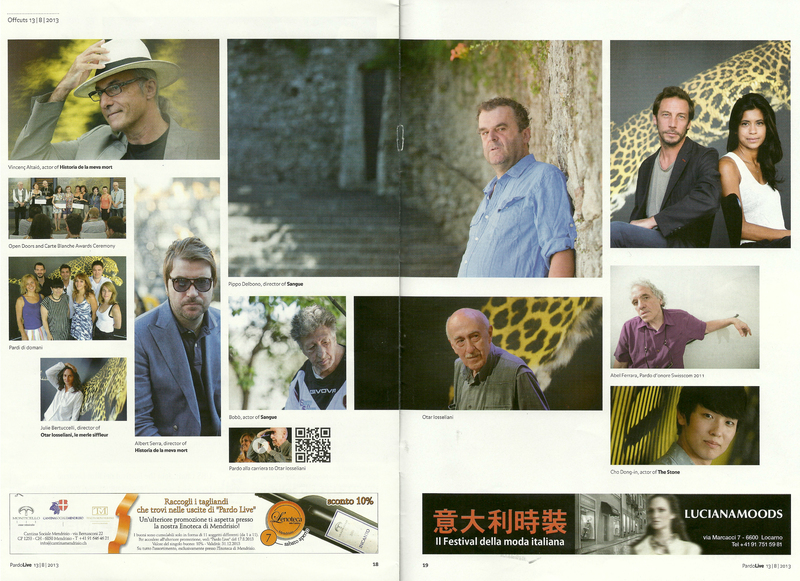 The official daily magazine of Locarno Film Festival Pardolive (date aug.13 2013) published a photo of some of the Pardi di Domani Directors and Producers whose films participate in the Competition section. 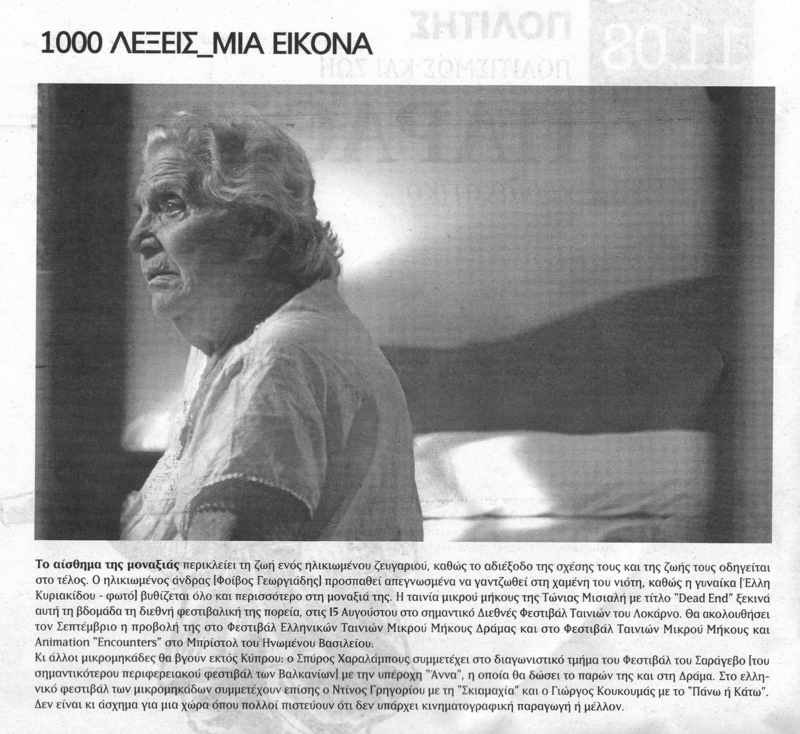 Article “1000 words – 1 image” in Politis Newspaper of Sunday, August 11 2013 was dedicated on DEAD END and its Festival journey! A special mention on DEAD END’s world premiere in Locarno Film Festival (as they say “Locarno Film Festival is one of the oldest and most important International Festivals) as well as its Greek and British premieres in the Greek Short Film Festival of Drama in Greece and Encounters Short Film & Animation Festival in the UK respectively. A press release is posted by the Ministry of Education & Culture of Cyprus on its official site, where the importance of DEAD END’s official selection in the Competition Section of Pardi di Domani at Locarno Film Festival is stressed. In the same press release, it is also stressed that all the films screened at the Pardi di Domani Competition are also planned to be screened in Paris in September 2013 with the support of the Swiss Cultural Centre in France. The P.I.O. (Press and Informations Office of Cyprus) has published an announcement on its official site about the Cypriot films competing in Drama Short film Festival with specific reference to DEAD END and its other Festival participations. The site newsit.com.cy has published an article about the Cypriot films competing in Drama Short film Festival with specific reference to DEAD END and its other Festival participations including LOCARNO FILM FESTIVAL. An article on the site 24H.com.cy about the four Cypriot films competing in Drama Short film Festival with specific reference to DEAD END and its other Festival participations. ilovestyle.com has written an article on DEAD END and its World premiere in Locarno Film Festival. The title “A Cypriot film in International Festivals”. The trailer of DEAD END on straw dogs magazine blog as a favourite video of the week…. The Greek movie site flix.gr has written an article about DEAD END and Director Tonia Mishiali travelling to Locarno for DEAD END’s World premiere in August 2013 at the 66th Locarno International Film Festival. Another article on the same site DEAD END is being mentioned as the only Greek film participating in the competition section at Locarno. The Greek movie site flix.gr published an article on 66th Locarno International Film Festival‘s lineup. DEAD END is being mentioned as the only Greek speaking film participating in the competition section the Festival. 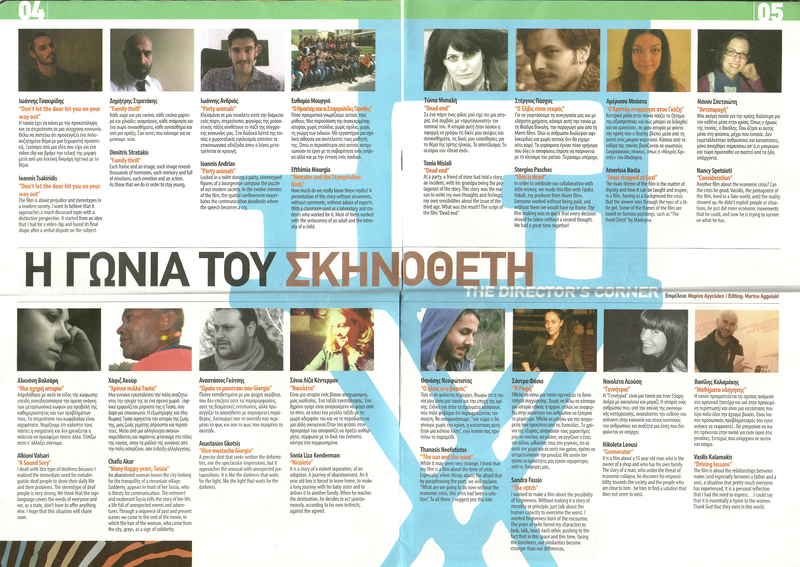 Parathyro.com has dedicated an article to the Cypriot films that have been selected in the National Film Festival of Drama 2013. DEAD END is one of them. You can visit the site and read the article HERE. 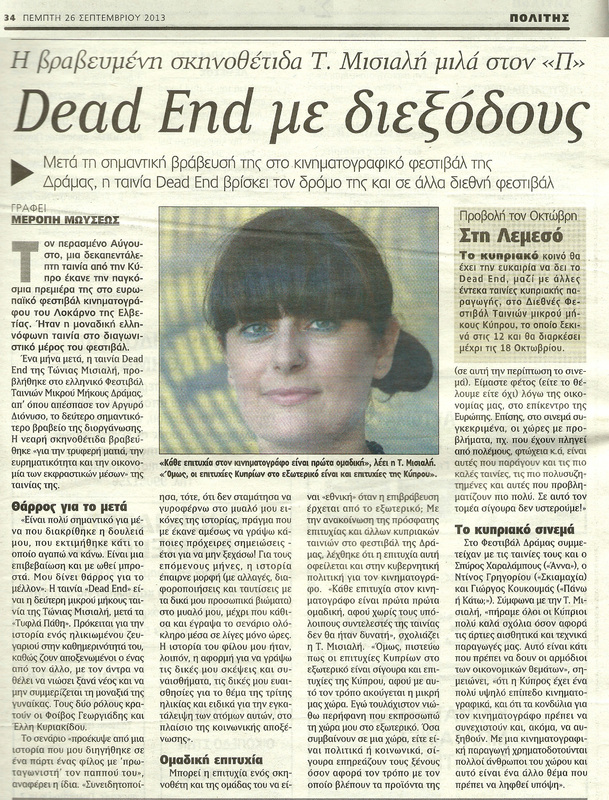 Melissa Heckers wrote an article about DEAD END’s predictions in Cyprus Weekly. Music.net.cy announces that the musical play “Centuries away from Alaska” restarts its presentations after the Easter break. Music.net.cy has announced the premiere of the musical play “Centuries away from Alaska” on its site. 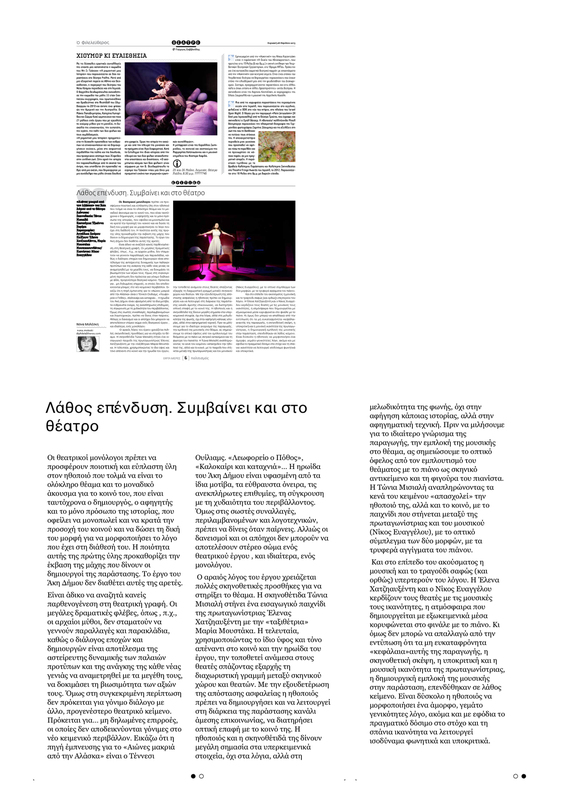 An established theatre critic from Cyprus, Ms Nona Moleski watched the play “Centuries away from Alaska” and wrote about it in Fileleftheros Newspaper with what seems to be a really good review as far as the directing and the production of the play is concerned. She seemed however to have disliked the play itself. Nonetheless, this is a very good review! 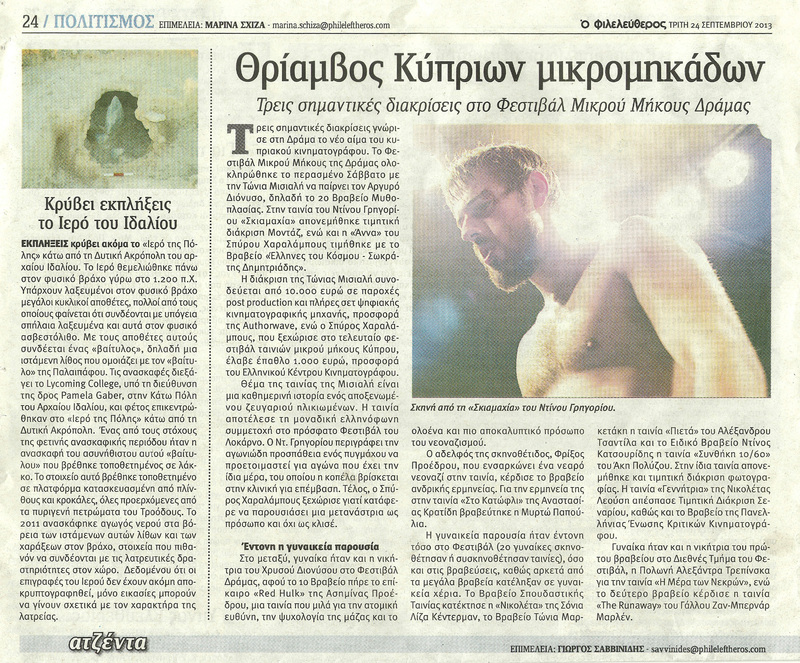 ΜΑΧΗ newspaper wrote a review of the play “Centuries away from Alaska” directed by Tonia Mishiali for Dionysos Theatre in Nicosia. Director Tonia Mishiali, actress Elena Hadjiafxenti and musician Nicos Evangelou were invited to CYBC 1‘s Sunday show “WITH GOOD COMPANY” with Host Vivian Kanari to promote the play “Centuries away from Alaska”. 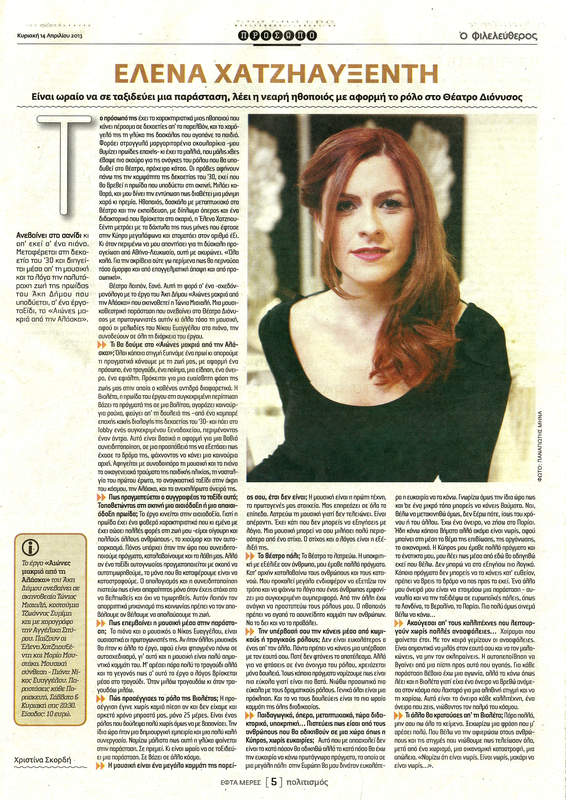 Elena Hadjiafxenti, the actress who plays in the monologue “Centuries away from Alaska” (directed by Tonia MishialI) talks about the play to Fileleftheros Newspaper published on 14 April 2013. The trailer of DEAD END on FIRSTPOST. 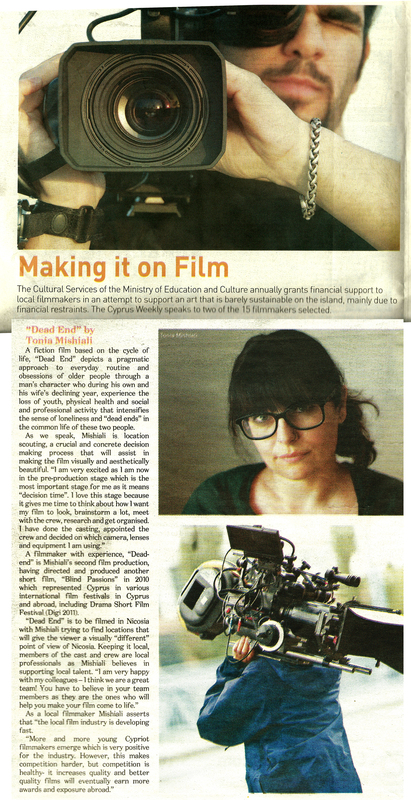 Tonia Mishiali was interviewed by Melissa Heckers for Cyprus Weekly Newspaper (oct. 5-11, 2012) concerning her second short film DEAD END and the pre-production stage. 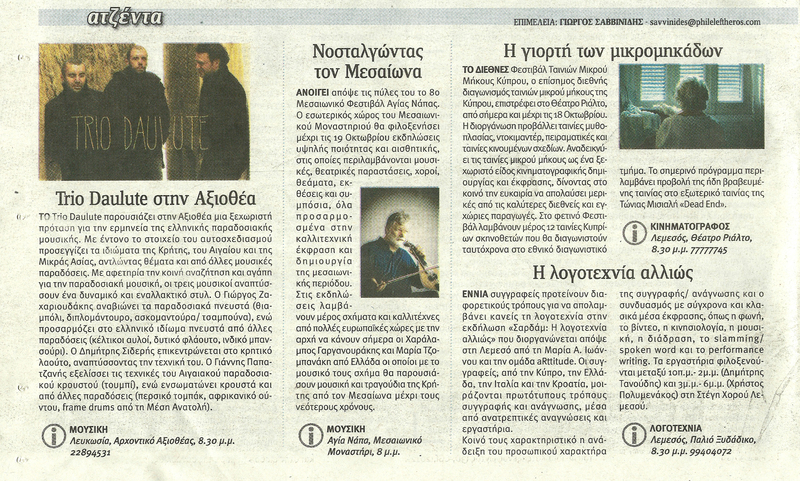 The Newspaper Politis wrote an article about all the films that got funded by the Ministry of Education & Culture (Cinema Advisory Committee) for the year 2012. Tonia Mishiali was one of the successful applicants. The site http://www.parathyro.com wrote an article about all the films that got funded by the Ministry of Education & Culture (Cinema Advisory Committee) for the year 2012. Tonia Mishiali was one of the successful applicants. Parathyro.com writes an article about Inanimate Collateral Loop Performance. The 3rd Dance Movement & Performance Arts Festival on cyprusevents.net. Tonia Mishiali participated as a Director staging the performance Inanimate Collateral Loop_part II with teams Project(If) and Sold-out. Sigmalive.com writes an article about the photographic exhibition “Only one in colour” by Tonia Mishiali.